서울, 대한민국의 이태원 N 게스트 하우스 | 호스텔월드에서 예약하세요. 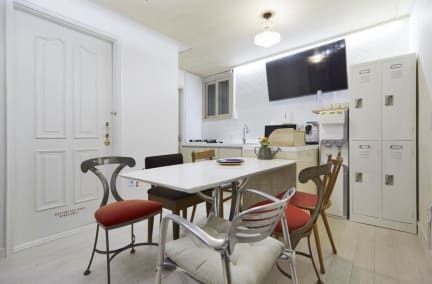 G Guesthome is the 2nd G Guesthouse, which opened on March 2015, located just 4-minutes walk from Exit 4 of Itaewon Subway Station (Line 6) and just 5-minutes walk to G Guesthouse. G Guesthome offers private, 4 Beds and 6 Beds dormitory-style rooms with free WiFi. Featuring a balcony and terrace, each room at G Guesthome has air-conditioning and heating facilities. All rooms are fitted with clothes racks and personal lockers. Bathrooms and toilets are shared for all rooms. We offers complimentary continental breakfast : toast, jam, coffee, eggs, milk and juices between 08:00 and 10:00 daily, all are available at the shared kitchen and dining common area. Services including free luggage storage, free laundry facilities, Halal dishes for Muslim, bicycle rentals, cell phone rental service, and free transportation card rental service are provided for your convenience. Guests can rent camping equipment at a surcharge. Staying in G Guesthome, guests can enjoy facilities in G Guesthouse as well, especially the rooftop barbecue at G Guesthouse from April to October on selected weekends. 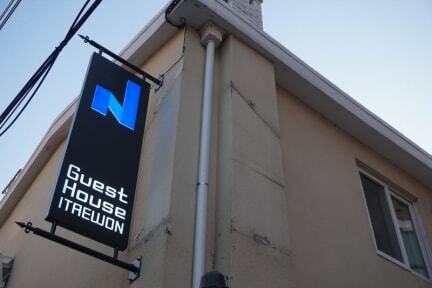 The lively Itaewon Street, full of restaurants and bars, is within a 10-minute walk from G Guesthome. Gyeongnidan-gil, another popular dining district, and the renowned Leeum Museum of Art are each a 10-minute taxi ride away. It’s nice place and the staffs are very kind. I would definitely stay here again if i visit Seoul. 조용한 주택가 근처라 좋았습니다. 입구에 카페가 있어서 좋았고, 숙소도 깨끗하고 시설들도 깔끔했습니다. 주택가 주변에 있어서 밤에 시끄러운지 모르고 잤어요 . 다만 화장실이 너무 좁아서 그건 좀 불편했어요 스텝분들이 엄청 친절하세요 !